We joked that it “Tastes delicious on the nose!” like walking into a cookie store! It really teases, from sweetness to bitter with a beautiful balance. Another thought it would make a great “cigar” malt…. We speculated it must have a high alcohol content – likely cask strength, definitely Scottish, well constructed though we thought perhaps it may not be very old – perhaps 8 – 12 years? We really appreciated its fabulously long finish. We also observed it had a terrific synch between its aromas and palate – both delicious and mirroring their notes. The reveal was such a surprise. None of us would have guessed it could be 20 years. Some remarked their mixed experience with Glenrothes, finding it sometimes over-priced for what it delivers. In this case, it was a fabulous dram. Unfortunately North Star bottles have a tendency to fly off the online “shelves” quickly! 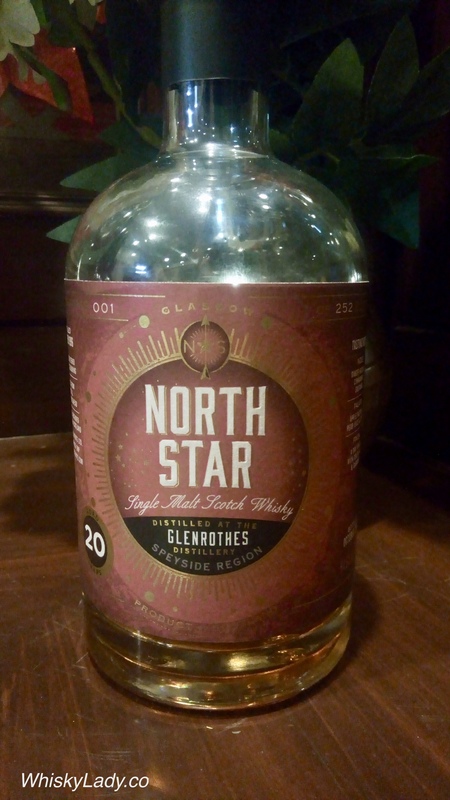 This entry was posted in Scotland, Speyside and tagged Glenrothes, Glenrothes 20 year, Independent Bottler, North Star by Carissa Hickling. Bookmark the permalink. I haven’t tried this one yet, but I am generally a huge fan of North Star. It all started with me spotting their eye-catching labels on display in a whisky bar and ordering a dram of Port Dundas 12yo out of curiosity. I bought a full bottle the following day and kept ordering at least one release from each series ever since. In return, Iain has sent me a bunch of samples from each new series he released. He really has a talent for sourcing outstanding casks! Let’s just say there were a whole bunch of fan “converts” after this session! Iain does indeed have a knack – and we are the beneficiaries!